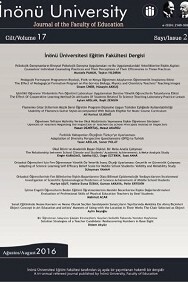 Inonu University Journal of the Faculty of Education (INUJFE) is a refereed open access electronic journal devoted to the dissemination, criticism, interpretation, and encouragement, interpretation, and encouragement of all forms of systematic enquiry into education and fields related to or associated with education. Our audience includes members of government education departments, school boards, school councils, faculties of education, parent organizations, school staff, and a broad audience of persons interested in educational issues. INUJFE is published triannually in the Spring, Summer and Fall by the Faculty of Education, Inonu University, in Malatya, Turkey. It was founded by the Faculty of Education of Inonu University in 2000. The journal publishes articles related to all educational issues from early childhood to adult and continuing education, special education, vocational and professional education, curriculum, educational administration, policy and planning, educational research techniques, etc. · reflective commentaries on published submissions, etc.